It is Friday and you and your team may feel mentally worn out just like this cat. It doesn’t have to be that way. The work atmosphere in most manufacturing companies is unfortunately very problem centric. Thinking and speaking about problems day after day will take a toll on your mental and physical health if you don’t have a mental strategy in place. Anyone can spot problems but if you train your mind to become more solution-oriented, you will be able to give the word “problem” a different meaning. If a problem is seen as an opportunity to become better or as a possibility to find new ways of doing things, it puts a positive spin on your daily challenges. Everyone on the team has to understand that they have 100% control over their own attitude. What you focus on is what you will get. 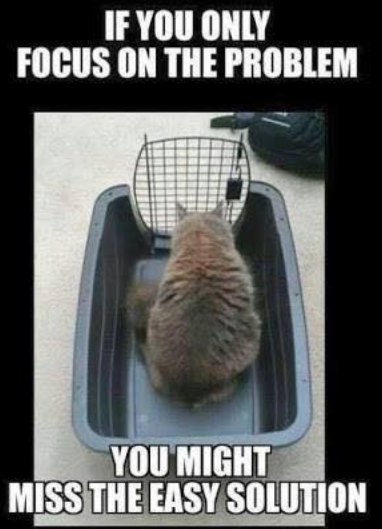 If you focus on problems, you will get more of them. If you focus on the possibilities, you will start seeing all of the opportunities. Have you ever noticed how many “PCs” (professional complainers) are tolerated at our workplaces? Be aware of your own positivity first. How do you look at things? Is your language positive or negative? Do you expect people to fix issues or do you expect them to find solutions? The way we speak is very powerful. We should never expect more of others than we are willing to deliver ourselves. Make others aware that their complaining attitude has a negative effect on the whole team. No “PCs” allowed! For the next 3 months make positivity a priority. Start observing how people speak to each other. Be aware and make others aware. You can be the smartest person in the room but if you cannot transform your thoughts into a meaningful message, your team won’t understand what you are trying to say. They have to know where you are going, why you are going there and why they should come with you. What would it be like if people would do what you want them to do, not because they have to but because they want to? Write down 3 positive workplace behaviours that you would like to see. If you want to see more kindness, be kind. If you want to see more initiative, take initiative. If you want to see people take on responsibility, you must take on responsibility. Start living and breathing your own expectations. If you observe these positive behaviours, acknowledge and reinforce them over and over again. For the next 3 months look for the behaviours you want to see instead of complaining about the lack of them. I’ll say it again, acknowledge and reinforce. You don’t want to be a “PC”, do you? Behaviour change is based on a person’s identity. Every person has certain beliefs about themselves. If you believe that you are not a people person, you are right. If you believe that you can develop better people skills, you are right as well. You can choose what to believe. How awesome is that? If you believe that your people can make a difference, they will. What are your beliefs about your role in the team? How much influence do you have? For example: “I am the type of leader who connects well with the people on my team.” Please remember that you do not need to have a title to be a leader. Start proving it to yourself with incredibly small and simple steps. An example of a small win could be to schedule 1 hour a week to have a conversation with different team members. Get to know them. Show that you care. What is going well? Where do they see improvement opportunities? If you start to think different, you will feel different and if you feel different, you will act different.